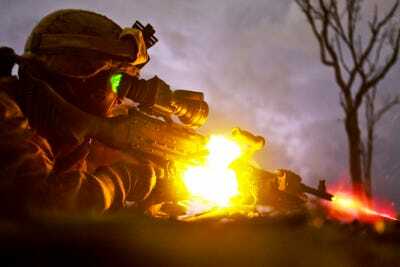 U.S. Marine Corps photo by Sgt. Sarah FioccoUnfortunately, military activity is good for economic growth too. It’s the oldest battle in politics: Whether cutting government spending helps or hurts economic growth. … austerity subtracted about 0.76 percentage points off the real growth rate of the economy between the middle of 2010 and the middle of 2011. If real government spending had remained constant at mid-2010 levels and everything else stayed constant, (yes we know these are big assumptions) the US economy would now be about 1.2 per cent larger. There’s a secondary conclusion, too: War is good (economically), it turns out. Conservatives say that government needs to get out of the way of the free market because government spending is inherently wasteful — it distorts the market by destroying opportunities for private companies to step in and provide valuable, profitable services based on actual supply and demand. Liberals take the Keynesian line that government spending acts like an economic multiplier: It not only generates immediate economic activity by guaranteeing that money is spent (creating demand), but that spending provides an opportunity for private actors to recycle the money into further investment and further spending. 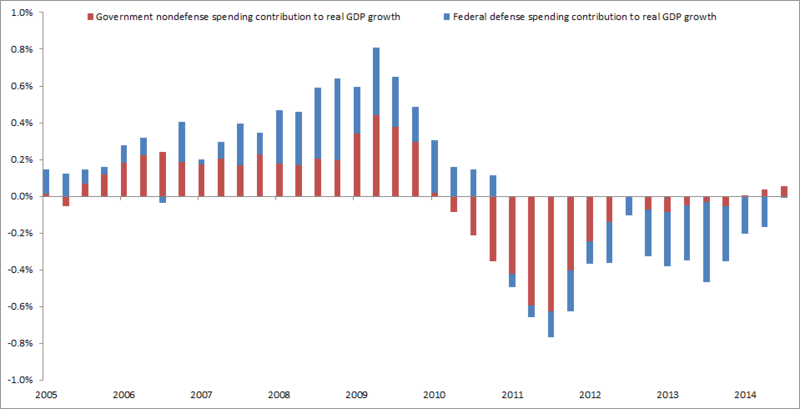 Klein has another chart isolating the effect of defence spending on growth. Reduced military spending — the withdrawal of troops from Iraq and Afghanistan, basically — also hurts growth. 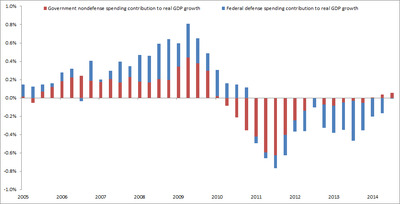 The chart shows that as military spending went negative in 2011, it truncated GDP growth. Only recently, as non-defence government spending has outweighed defence cuts, has total government spending been a net contributor to GDP again. The depressing conclusion to all this is that the only thing both left and right can agree on, based on this data, is that foreign wars are good for the economy.